Swedish massage is considered to be the backbone of all massage. It was developed in the 1700's by a Swedish doctor, and has long been thought of as the first organized method of modern massage therapy in the western world. The specific strokes and manipulations of Swedish massage are each conceived as having definite therapeutic benefits. The goal of Swedish massage is to speed the return of de-oxygenated blood and toxins from the extremities. Swedish massage shortens recovery time from muscular strain by flushing the tissues of lactic acid, uric acid, and other metabolic wastes. It increases circulation without increasing heart over-load. It stretches the ligaments and tendons keeping them supple and pliable. Swedish Massage also stimulates the skin and nervous system, and soothes the nerves themselves at the same time. It reduces stress, both emotional and physical, and is suggested as a regular program for stress management. It includes long strokes, kneading, friction, tapping, and shaking motions. Deep tissue massage is used to release chronic muscle tension through slower strokes and more direct, deep pressure with friction applied across the grain of the muscles, not with the grain. Deep tissue massage uses an invigorating technique to detect stiff or painful areas by determining the quality and texture of the deeper layers of musculature then slowly working into the deep layers of muscle tissue. Specific hand positions and strokes are then used to respond to the tissue qualities. Techniques using breath and movement are also used for releasing muscular congestion and relaxing muscle tissue. Myofacial release can help to restore correct function of the connective tissue, relieve pain and aid towards postural balance. Sports Massage Services are geared specifically for those individuals who are physically active on a regular basis, are perhaps the weekend warrior types, or for those individuals who just live a physically demanding lifestyle. Individuals who are active, either through work or "play," tend to become hurt or sore. These individuals are in need of a massage modality, which will help them maintain their active lifestyles, and recover faster. A sports massage on a regular basis will assist with the body's natural recovery process, thus speeding up healing as well as helping to prevent future injuries for those sore and stiff muscles. Each sports massage session will incorporate a variety of massage techniques, which will be customized to the individual needs of the client to help them "feel better" faster, enabling them to get "back into the game" of life! A typical session might include traditional Swedish Massage, and Neuromuscular therapy techniques, as well as various stretching modalities such as static stretching, active range of motion, or active isolated stretching. Helps mom to relax and alleviates fatigue. A specifically formulated massage modality, created to meet the needs of post partum mothers. Modified for natural delivery or C- section, this modality of massage can assist with hormone regulation, stress reduction, pain relief and improved sleep. Massage is indicated immediately after a natural delivery and 6 weeks post C-section, authorization from your Ob is recommended. Raindrop Therapy combines the art of aromatherapy and massage in the application of essential oils, bringing balance and harmony to the body – physically, mentally and emotionally. We use only the purest of Young Living Essential Oils. Thai Herbal Poultice Massage is an ancient body treatment dating back to 14th century Thailand. A steamed bouquet of herbs, including camphor and turmeric, is kneaded and rolled on the body opening up pores and sending deep therapeutic heat into the muscles. A meditative Royal Thai aromatherapy massage accompanies this treatment helping to detoxify and release blocked energy flow. Anyone suffering from poor circulation or muscle stiffness can benefit from this service. Bath Tea: Place in the bath and let the herbs dissipate in the water like a bath tea and soak. It’s great for joint and muscle pain and will also provide detoxification benefits. You can use it for self-massage while in your bath. Massage: To re-heat for use at home, you can re-steam in a vegetable steamer, or microwave. In either case, make sure the poultice is hydrated before heating, especially in the microwave to avoid it catching on fire since it heats from the core. Potpourri: Some people just love the aroma and like to place it on their desk, pillow or living area. It can also be unwrapped and the herbs placed directly in a bowl to enjoy the natural aroma. Lymph Drainage (LDT) is a therapy used to lightly push lymph through the system, helping it to drain out of the tissues and move throughout the body. This treatment is commonly used to help with lymphedema, which can occur for a variety of reasons, most often due to circulatory conditions and post surgery. This modality of therapy is a very light touch with movements in specific directions. It is most often recommended as a series of treatments for optimal results. During this indulgent modality of massage, heated basalt stones are used to create a sensation of warmth and comfort to melt all your tension and stress away. The result of this therapeutic treatment is an increase in circulation and lymphatic drainage. An excellent choice for those looking for warmth in the winter months, or for those with chronic muscle tightness and fatigue. Salt Glow Massage applies scented oils to the body in a relaxing massage to which therapeutic salts are added. The salts stimulate circulation and remove dead skin cells that block pores and dull the skin, thereby improving the health of the skin. Sea salt, herbs, powdered algae, and dried botanicals are combined to smooth and detoxify the skin, hydrate and re-mineralize. At MSMT our salt glows are delivered with a full body massage, hot steamed towels, body glow mist, and an application of pure aloe gel leaving the body renewed and the skin feeling silky smooth and radiant. A combination of mineral salts, lemon and orange zest, and essential oils of grapefruit and lime tones muscles, stimulates the lymphatic system and firms the skin while mind and spirit respond to the refreshing scent of summer fruits. The salt contains ground lemon and orange zest. The massage oil contains apricot kernel oil, grapefruit, lime and lemon grass essential oils. The body mist contains spring water, sweet orange, lemon and wintergreen essential oils. Think Toning! Take a break from your stressful daily routine to stop and smell the nutmeg and clove in our Pumpkin Spice Body Scrub. These aromatic spices are excellent stress-busters and their balancing and nourishing properties can help ensure that you are energized for the upcoming season. The Fall is a frenzy of activity so remember to take time for yourself to maintain optimal health and wellness. Indulge in this delicious full body exfoliation scrub made with pure cane sugar, fine ground coffee and natural exfoliant seeds in a creamy, thick buttery base. Slough away dead skin cells, stimulate the lymphatic and circulatory system and improve skin tone, this treatment is truly decadent. Relax into the intoxicating aromas of coffee, crème brulee and chocolate. Exfoliation is completed with the use of warm towels and followed by a full body hydration massage with cocoa cream lotion. Relax and unwind with this scrumptious exfoliating salt scrub. Infused with Lavender essential oils and honey, this full body treatment leaves your skin silky smooth. Stimulating exfoliation is followed by the application of warm towels and concludes with a full body massage using a lovely light lotion. Bamboo Massage is a modality that uses bamboo stalks of varying lengths and diameters to provide deep-tissue work. This massage promotes circulation, sensory nerve perception, and lymphatic drainage and provides a deep sense of relaxation and well-being. In the Orient, bamboo symbolizes strength, fertility, youth, prosperity and peace. Enhanced circulation can remove stagnant toxins and move blood throughout the body, heart and lungs, improving internal respiration. Oxygenated blood will return nutrition and healing aid to the cells and tissues of the affected areas. This allows the massage to be deeper to relax and realign muscle fibers without causing micro tears. Bamboo and Stones...what could be more relaxing? If you've experienced the relaxation effects of a hot stone massage, you will surely love the combination of bamboo and stones. Both stones and bamboo are heated to a comfortable temperature, and worked into the muscle to melt away any stress or tension you may be experiencing. You will be surrounded by stones throughout your massage embracing you in heat as you enjoy your massage. Heated stones are placed in mitts for your hands, and booties for your feet. 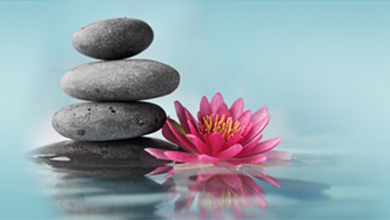 We start your massage working each muscle group using our hands to calm; stones to relax; stix (bamboo) for a deeper, therapeutic touch; switching back to stones; and finishing up with our hands, once again as a calming technique. If you'd like to learn more about this pampering massage, you will have to make an appointment and try it out for yourself! Reflexology is a non-invasive therapy based on the principle that there are small and specific areas of innervation on the feet which correspond to specific muscle groups or organs in the body. Reflexology stimulates the nervous system to release tension, reduces stress, and helps the body achieve and maintain balance. Designed especially for hands and feet, this delightful treatment incorporates a coconut scrub, hot stones in mittens and booties, warm towels and a hand and foot massage using our decadent berry body butter. Utterly irresistible! Chamomile, hyaluronic acid, silicon, aloe vera, Vit A, C and E. Who is this for? Anyone post sun exposure, with hormonal or medication impact and frequent travelers. Natural green pigments, bisabolol, shea butter, arnica. Who is this for? Those with sensitive, hyper reactive skin or prone to localized redness. Rosemary, Beech Bud Peptides, Horsetail, and Yarrow. Who is this for? Anyone lacking skin tone and firmness, post weight loss and post surgery. Experience the true decadence, which combines woth treatment for the face and body. Perfect as a gift, thank you or indulgent pick me up. Your hands and soles will be exfoliated for that extra special touch and hydrated for that extra special glow included in your massage. Uses the natural oils extracted from flowers, bark, stems, leaves or other parts of a plant to enhance psychological and physical well-being. Can be included in any massage.